Fantastic DNT (Norwegian Trekking Association) waymarked walking in Norways oldest national park. One of the few places in Europe where wild reindeer roam; also spy elk, wolverines, a few bears and occasionally a musk ox. Wolves are rare. The park surrounds a central ribbon lake, narrow and frigid Rondvatnet, in what is its deepest valley. Surrounding it are various massifs and mountain ranges named for the lake, with ten peaks above 2,000m. Each of these higher peaks are within a days walk from the lake; so depending on your itinerary, walking here can be tough and in high, remote mountains, on which you will have to be self-sufficient. Come prepared. Rondane National Park is Norways first, somehow maintaining its feeling of isolation and untouched wilderness despite being only a few hours drive from Oslo. The park covers an extraordinary 200,000 acres, so theres quite a lot nearby, too: Gudbrandsdals sheer cliffs, Dovre National Park, and fabled Jotunheimen, Home of the Giants. Rondane doesnt miss out on folklore, either, existing as much within the world of myth as in reality (Ibsens Peer Gynt). This is elven and troll territory in the lower reaches; above, giants stalk the glaciers making flutes from the shinbones of men, as they do in Tibet with thighbones. Pristine autumnal colours in beautiful light, and glaciations strange legacy of kettle holes, eskers and botns (flat and barren stone valleys incising the steep cliffs, linking peak to peak), make for stunning views in every direction. Practically nothing grows above 1,500m, and the larger mountains are almost completely bare save for their glistening snowcaps: herds of wild reindeer are pretty much the only evidence of hidden mosses and lichens; the glacier snowfoot one of the only wildflowers hardy enough to survive. Animal life is more plentiful, however. As well as the reindeer (approx. 4,000 of them), see roe deer, elk, musk ox, wolverines, bears, and the occasional wolf. Walking in this stark and barren, blissfully remote-feeling region is endless. The DNT (Norwegian Trekking Association) maintain and waymark a host of trails throughout the parks wilderness - look out for red Ts marking DNT routes. Walk the lowlands (its all relative: the parks lowest point is around 1,000m above sea level, and the treeline only reaches maybe 150m above this), across tundra (fjell) and plateau and through sweeping valleys. Or, climb some of the national parks mountains to get big views of empty landscape - untouched by man - falling away beneath you. Walkopedia member Experience_Matters favourite walk: Straumbu to Bjornhollia to a very nice waterfall, & back to Straumbu. See his pictures in the Photo Gallery. The hike starts from Straumbu car park, then through the woods. The first climb takes you to a plateau that gradually gets you higher. Suddenly you see some beautiful small lakes, yellowish moss everywhere, and a nice panoramic view of the National Tourist Road that goes through Rondane. The hike now swings round a small mountain towards the Bjornhollia Cabin (where you could eat a hot meal). From the Bjornhollia cabin you take the hike towards the Hgronden mountain (2,115m). You follow the flanks of the mountains until the path goes down towards the river. Here you see a very nice layered waterfall with a small suspension bridge. Go over it, still following the DNT route towards the Hgronden mountain (2,115 m), and around 300 meters higher then the waterfall you follow the trail to your right, which brings you back to Straumbu. This is not an official DNT route, but the path is clearly visible & guides you through the Vesllldalen where you see nice layered rocks everywhere, back to the plateau, back to the Straumbu parking spot. We managed to do the full hike in 9 hours, with lots of stops to take pictures of the astonishing landscape. Jutulhogget & Storrenden/Rondslottet: First, pick your way towards and into Jutulhoggets claustrophobic walls from the Rondvassbu hut. Its walls are 20-30m high, characterised by folded and sheared layers of rock, formed in a hurry by rapid glacial melting. Although the torrent has lessened (Rondane doesnt receive enough precipitation to maintain glaciers), the water still rushes through the steep canyon and bars your way pretty soon. The rock is dangerous when wet and/or icy. Back out, then, and 2,000+ft of hard ascent takes you to the top of neighbouring Storrenden (or Rondslottet, 2,178m, one over). Rondslottet, The Rondane Castle, is the highest mountain in the park. Their combined massif looms steeply over the eastern side of Rondvatnet lake. Follow the red T trails upwards to get enormous panoramas in every which direction: eastwards over plateau, fjell and mountains, to Gudbrandsdals cliffs; west, to the even more rugged Smiubelgen range and beyond (see below). The Blacksmiths Bellows: A circuit from Rondvassbu traversing Smiubelgen, The Blacksmiths Bellows, and down and back round to the hut. This trek is difficult and involves nerve-wracking scrambles across the sharp, jagged ridges that distinguish the Smiubelgen range from Rondanes eastern massifs. Only for the experienced. From the DNT hut climb to the western approach of 2,016m Storsmeden, The Big Blacksmith. The terrain is rugged and ridges fall from the peak, shattered and roughly chiselled by wind and rain and ice. The one you climb up is the easy bit, or at least straightforward: from the peak itself its a scramble over and down its eastern flank, across a giddy arte, before a treacherous climb up Veslesmedens own western side. You dont need to be a mountaineer, but you do need to be experienced. Atop Veslesmeden, capture another beautiful 360-degree vista from right on the doorstep of Jotunheimens giants. This page is at an early stage of development. 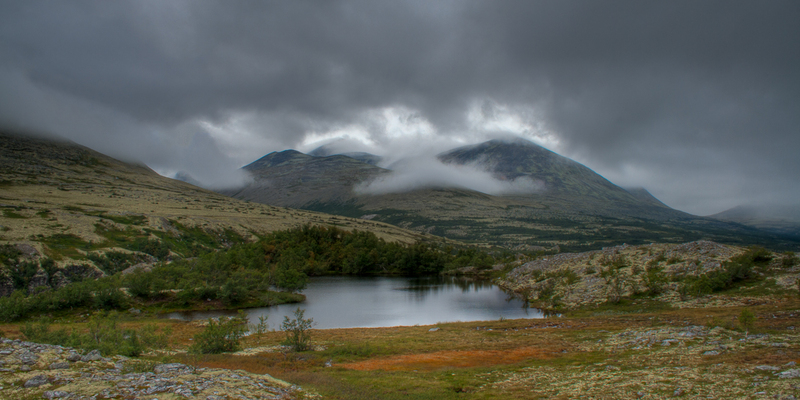 Please help us by recommending your best rondane walks and sending in photos! Thank you!